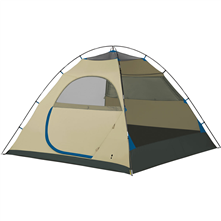 We purchased the Tetragon 8 to replace an old store branded dome style Eureka tent from 1998. Overall, we are very happy with this tent. 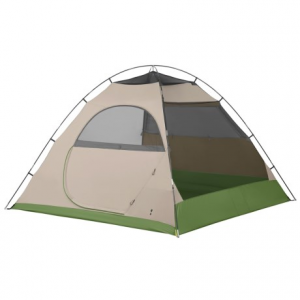 Our major factors in selecting a tent were price, how hot the tent was inside (we live in Texas), ease of set up, weight, and space. 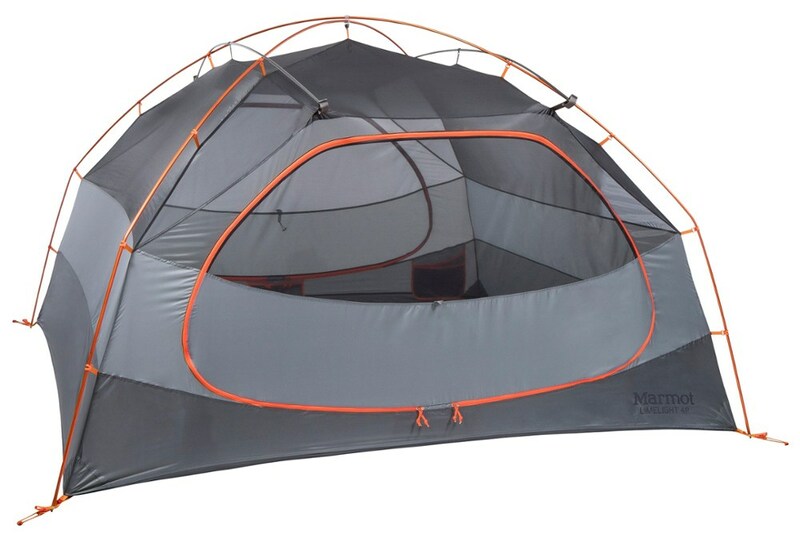 We wanted this tent for car camping with an eye towards some very short backpacking trips. The tent needed to fit two adult women (neither of us is small), our gear and a 62 lb dog. After much research, we decided the Tetragon 8 was the best option. Our first experience with setting the tent up was in the back yard in the dark under a new moon. Neither one of us pre-read the directions, but by the light of an apartment building light to read the directions, we got the tent and fly up with no problems on the first try. After several times of setting it up and taking it down, I am unsure just how one person would set the poles in the rainfly without someone holding the other set of poles in the pockets. We are experimenting, but at this time, I'd suggest not trying to set this tent up by yourself when rainfly time comes. The remainder of the tent is very easy to set up and take down by just one person. Once the tent is up, you will find a very generous sized door, a window, and a fair bit of mesh. With the door and the window open, the mesh lets in enough of a breeze that we have yet to have any condensation inside the tent. The tent has not yet been through the Texas Rainy season. Inside the tent, there is a huge gear loft or drop pocket system. We used ours by stringing it across the top of the tent. We had a few odds and ends, but the repositionable hanging pockets on the sides of the tent sure have gotten more of a workout! The dark mesh doesn't allow the light from a headlamp to shine through quite as much as my old light gray mesh used to, but it was enough to see to dig through gear. The nice thing about the way we strung it was you could stand outside the tent, reach through the door, and access everything in the gear loft. The mesh side pockets kept the general pocket fluff we accumulate on camping trips secured and out of the way. The inside of the tent fit two Thermarest women's Trail Pros side by side, with plenty of room for an old Coleman egg crate next to it for the dog. It would be a VERY tight shoulder to shoulder fit to get 4 camp pads in there, and I'm not really sure if it is possible. We have no intention of trying! With two people plus the dog, we were able to fit our camping gear along the corners of the tent quite comfortably, but keep in mind neither of us is over 5 feet tall, and the gear did encroach on our sleeping area just a bit near our feet. The rainfly seems to be a good design. It covers all the areas of the tent I'd be worried about in a storm, and held up to the wind quite well, even not staked down really well. The rain fly let in PLENTY of air, and made sleeping in Texas in a tent about as good as it was going to get. The large mesh areas helped dissipate the heat of the day very quickly. While this is not a tent I'd take winter camping in February in Minnesota, I see no reasons it won't hold up to the occasional light snow it might see in Texas. We intend to camp all winter long in this tent. Our prior tent did survive several trips in heavy snow in Minnesota just fine, so the design should shed show pretty well. My only gripes come in the form of two. The first one was the expected. The tent stakes were not suited to the terrain of the Prairies and Lakes region of Texas that we have tested it in. We have switched tent stakes and hope to have resolved the issue. You can't expect much out of "pack in the box" tent stakes, so I am not deducting for this issue. Please PLEASE go buy tent stakes that are good for the region before you take this tent out in the wind! My second gripe is the zipper. There is a flap of fabric that covers the outside of the zipper track near the bottom. It precludes one handed entry completely. I can get the tent unzipped just fine one handed until you get to that flap of fabric. Then, it is a total no-go unless you have two hands. The zipper has been smooth other than this one area. Some other random observations: I am 5 foot tall. I cannot stand in this tent, but I can sit up and get most of the way up hunched over. The bathtub floor comes up on the door enough that a small child might have issues climbing over it. Our dog tripped the first few times, but has become a tent exiting pro. The guy lines that come with the tent are pretty useless. I'd suggest buying your own cord and rigging them up how best suits you. The center section that loops over the poles to hold the center of the tent is at the very top of my reach. If you are much under 5 foot, you probably are not going to be able to reach this attachment point. Good luck! Overall, I have been VERY pleased with this tent. 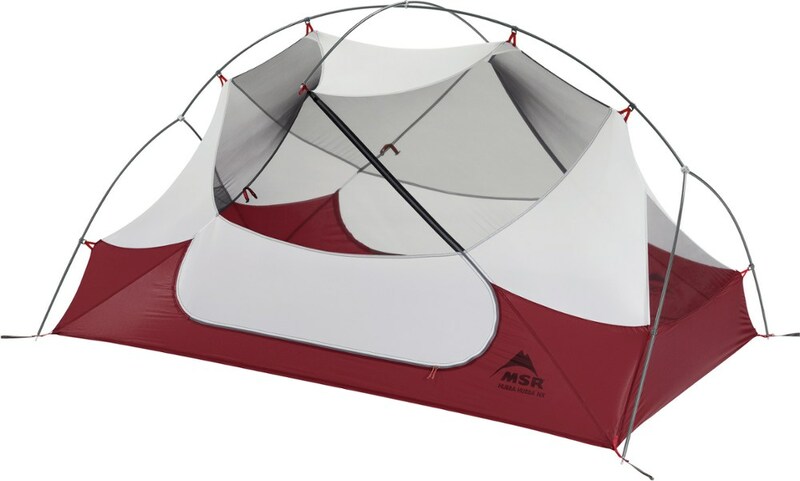 While it is not a lightweight, it packs up reasonable and offers a great deal of space for the price and weight. This was a last minute desperation purchase that really paid off. 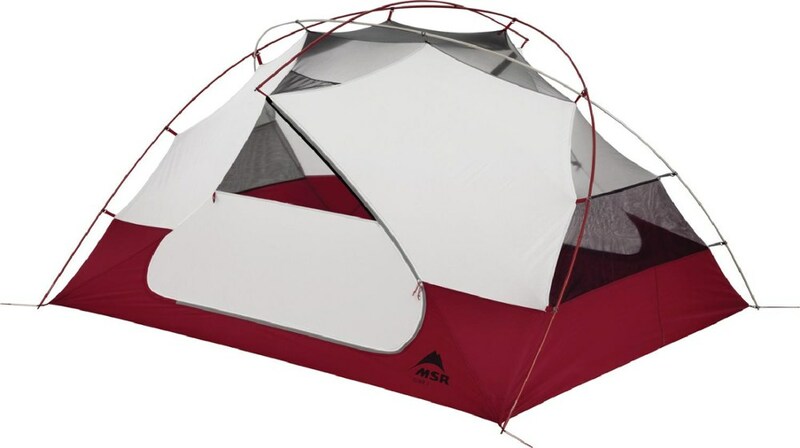 This is a lot of tent for the price. I set it up the first time under the immediate threat of a rain storm and it was extremely easy to do so. Rain protection with the fly is excellent. 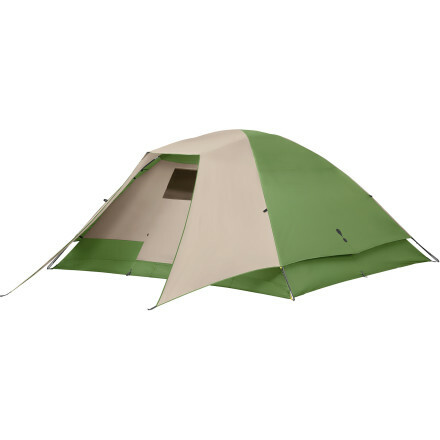 It has only two fibreglass poles to support the roof which may turn out to be a weakness down the line but the clip arrangement to attach the tent to the poles works very well and makes it an easy one-person setup. The tub is not particularly strong but seems to work well. Typical of most tents it does not come with a ground cloth, that I will definitely want to buy. The Eureka! Tetragon 8 is not available from the stores we monitor. It was last seen April 12, 2017	at Rocky Mountain Trail.